Ballpark Basics: A modern twist on the classic ballpark. Opened in 2015 CHS Field takes some chances with the classic ballpark design. With sleek modern lines around the stadium and a low profile and blends in with its center city location. The festive atmosphere starts before you even enter the park. With the popularity of the team and its downtown location, the streets surrounding the park are crowded with people. Add in the (sanctioned) tailgate section in the premier parking lot/farmer’s market right next to the entrance, you can start early. Upon entering the ballpark the first thing you notice is the ceiling of the concourse. Yes, the ceiling. 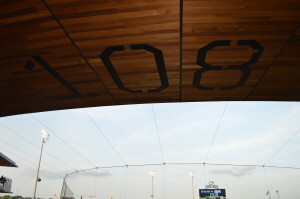 While most ballparks don’t think about the ceiling and leave it with just a view of the concrete from the upper deck, CHS Field has outfitted their ceiling in a beautiful wood. 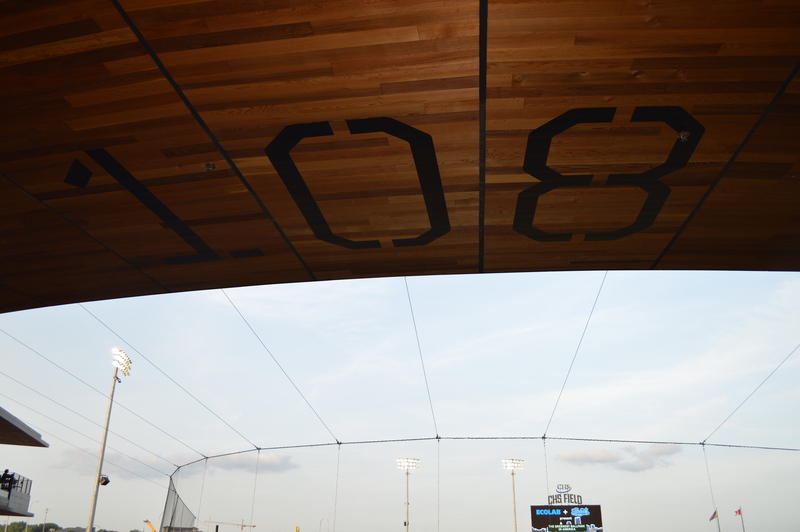 The section numbers are emblazoned on wood giving it a functional role and not just a fashion statement. 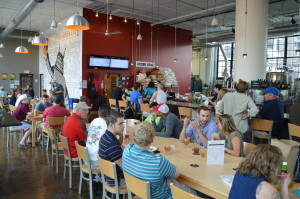 BEST BEER OPTION: Throughout most of CHS Field the beer options are fairly limited. Most concession stands carry the typical big beer options and there are some craft beer carts sprinkled throughout the park. However, once you make it to the Beer Dabbler Craft Beer Corner in the left field corner of the concourse your choices expand considerably. Here you will find a long list of local and craft beers as well as a large congregation of people. That is a thing that you won’t have a problem finding: people. 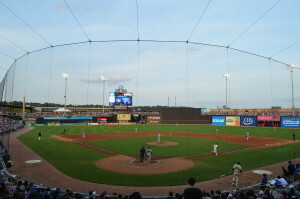 CHS Field has been a popular addition to the Twin Cities and the night we visited was no different. In fact, the ballpark is so popular the many seats that are typically general admission need a specific ticket here. There is small section of berm seating behind the left field wall. It actually appears to be too small. We saw people that spread out blankets on the the concrete walkway behind the right field wall just to stake out a spot to watch the game. 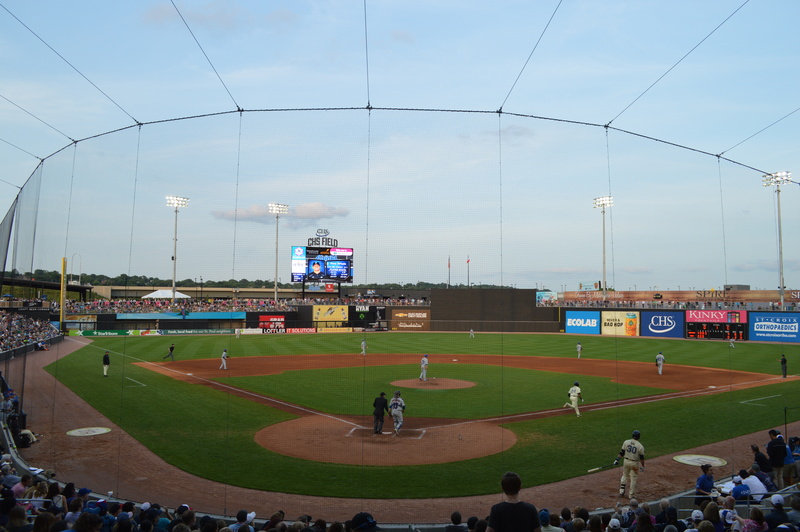 Our only real complaint with CHS Field is the lack of a team (or city) identity. 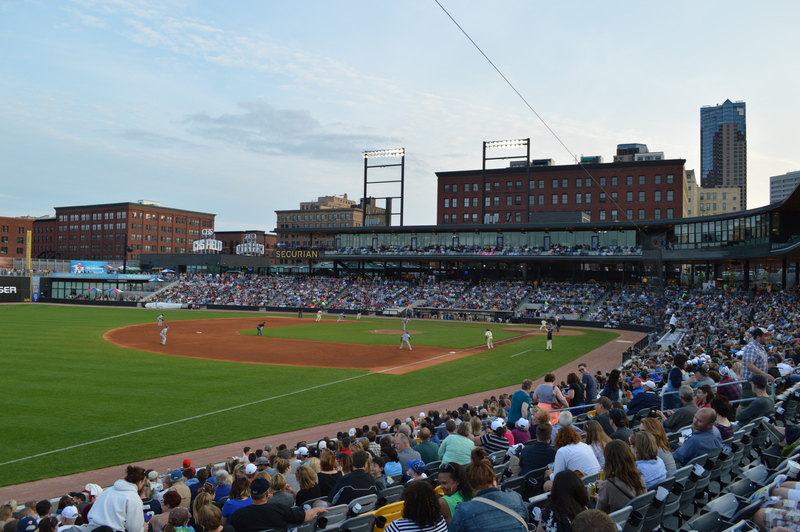 A team with the Saints moniker has played in St. Paul dating back to the 19th century. While this team has no relation to the original Saints it is a shame that this current team did not incorporate more of the team’s history throughout the stadium. CHS is plastered everywhere and you are fully aware of their naming rights. However, you almost don’t know where you are while walking around the ballpark since there aren’t many indications of the team or city. CHS Field is a prime example of how a ballpark can become a part of the fabric of the city. You could feel the excitement before the game as the restaurants that surround the ballpark filled up with people grabbing a bite and a drink before the game. With sellouts all season long, the Saints have given a reason for 7,000 people to come (or stay) downtown long after the work day ends. Brew Basics: Fun atmosphere, attention to detail, and easy walking distance to great restaurants and the ballpark. Tin Whiskers is in what appears to be an up and coming/revitalizing part of St. Paul. The building is in a good location, but due to lack of signage, may be hard to locate if you don’t know where you’re going. We were only able to find because we saw signs for a restaurant we knew shared the building. When you enter, you’re in a lobby. To the left is the door to the aforementioned restaurant. To the rear, entrance to bathrooms and a cork board with ads and announcements for the people living in the residences upstairs. On your right is the door to the brewery. Upon entering, there is a couch seating area immediately to the right, followed by a series of communal seating picnic tables all positioned to get a good view of the large bay windows that overlook the city streets. Immediately to the right is an enclosed office space with a Tin Whiskers logo mural covering the out facing wall. 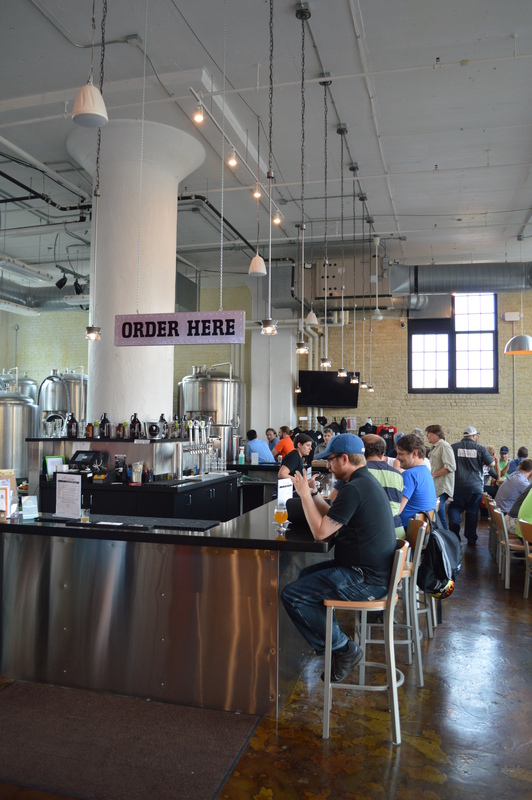 The wall opens up to the brewery and workspace, which you’ll face if you choose to grab a spot at the bar. 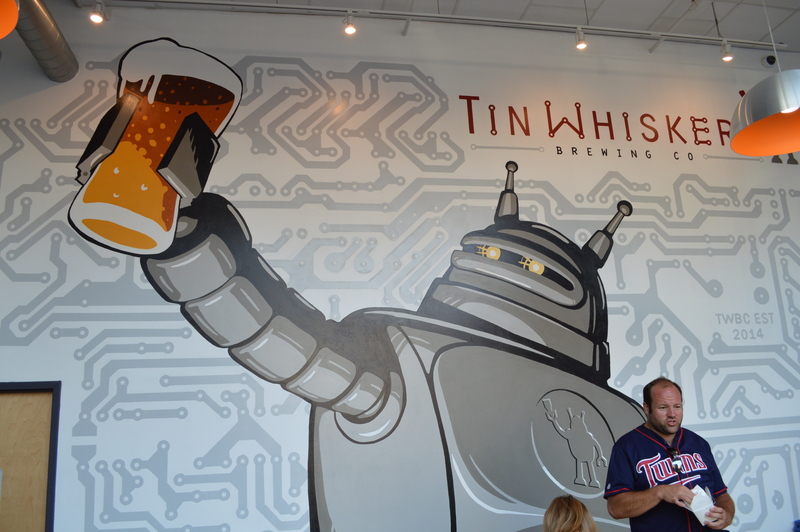 By the time we visited Tin Whiskers, we’d already been to at least three other breweries in Minnesota, and had discovered that sample sizes weren’t readily available. In fact, most places weren’t equipped to give you less than 12 or 16 oz of beer. This wouldn’t be something to complain about normally (especially when given the fact that a flight tends to run much more than a pint) but can be prohibitive when you’ve got one night and want to sample as many as you can. Wheatstone (5.4 ABV) – This was a unique honey chamomile wheat beer, and you definitely could pick out the chamomile tea smell in the bouquet of this very bright yellow/orange but hazy beer. The flavor was light, honeyed with soft peachy/apricot notes. Watts Wheat Wine (9.4 ABV%) A Beta Stage Anniversary Ale that again had peppercorn and orange peel notes. It was similar in color to the Wheatstone, but without the haze. You could smell some of the typical barleywine aroma but the taste was smooth and orange with honey at the end. Both this and the Wheatstone were delicious and a-typical. Flipswitch IPA – A “midwest” IPA 6.2 Strong blended hop aroma that was earthy, not sweet and well balanced. The IPA was hopped but still light with a somewhat of a chalky/wheat grain flavor and just a bit floral. Bitter Pale 4.5 – Part of the rotating Fourier Series that poured the color of apple juice and smelled sweet like canned fruit juice. Though not visibly so, the Bitter Pale was moderately carbonated and ended with a hoppy bitter tang. Short Circuit Stout 5.8 They had this iced tea colored beer on nitro when we were there and it was definitely the way to go. Already a nicely malted coffee beer, the nitro brought out the smoothness, so like the lacing, the coffee malts lasted and produced a malted, tangy finish.